Do you like to touch and feel when shopping? Are you tempted to pick up items you have no intention of buying just to take a closer look? Have you been chastised for reaching into a window display as if you’ve defiled sacred ground? If you answered “yes” to any of these questions, congratulations: at the eye of any Italian shopkeeper, you have just behaved in a shockingly bad manner. Italian shopping etiquette does exist: even with over 15 years of retail experience in the United States I was still puzzled as to how to behave in certain everyday situations. I had a vague idea of what was acceptable, but found myself being at times reprimanded. Thinking I might not be the only one perplexed, I decided to get to the bottom of this mystery. I asked 31 storeowners, managers and salespeople in a variety of retail businesses what they considered to be bad behavior, especially among foreign customers. Included in this survey were moderately-priced as well as Via Condotti-priced boutiques, specializing in a wide range of merchandise. As an extra benefit, the research provided valuable information regarding exchange and return policies. First of all, first impressions do count: respond to being greeted upon entering the store. This is common courtesy and sets a pleasant tone for your shopping experience. Do not assume the seller speaks your language. As Massimo Dipersio, a giornalaio in Trastevere, made clear, “I am Italian. I was born in Italy. Why should I speak their language?” Even if you don’t speak Italian well, making an effort goes a long way. Eating and drinking while you shop are high on the list of things you should not do for obvious reasons. Trailing close behind is smoking. Lighting up is generally considered forbidden in a shop (don’t forget that in Italy it is legally forbidden to smoke in public indoor locations like restaurants, bars and shops). The exception was where the shopkeeper answered questions between puffs. Chatting on a mobile phone grated on the nerves of several people interviewed, including the sales managers at the newsstand and the tobacco shop, and the produce vendor. If your phone rings, make the conversation brief or, better still, take care of business first, move on and then return the call. Handling the inventory is considered the “touchiest” subject. Not long after moving to Rome, I was reproached at a newsstand for flipping through a magazine. Then, there was the incident on Via Nazionale when my mother was visiting. She innocently picked up a sandal as we entered the store and was loudly berated for touching what was technically part of the window display. Window displays are absolutely not to be touched. Many stores have very little window space and if it is disrupted they cannot put their best face forward. The merchandise in the window is available in the store. Just ask, or smile and point. How much touching is too much depends on the type of merchandise. At Pier Caranti, a leather goods store in Piazza di Spagna, the owner Federico Calo explained it this way: “Of course it is okay to pick up and feel the leather, but don’t unzip and handle roughly.” Salespeople will gladly unzip and empty the handbag so you can take a closer look. 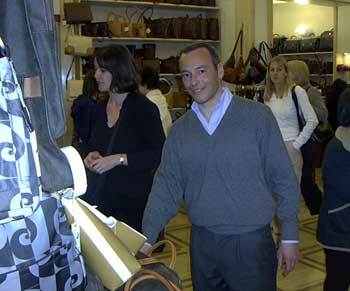 Comments were more forceful at high-priced stores with merchandise made from beautiful textiles. For example, exclusive children’s apparel and exquisite linen will quickly become shop-worn and unsellable from too much handling. In grocery stores and produce markets, it may be considered offensive to touch fruit and vegetables. Use the plastic gloves provided or allow the vendor to bag your choices. Every retailer, with the exception of the produce vendors, said they would exchange merchandise if it was presented in perfect condition, accompanied by the receipt, and within a reasonable timeframe, usually one to two weeks. In the case of a manufacturer’s defect an exchange would be granted as well. Surprisingly, refunding cash or crediting a charge card is not allowed. Taxes are paid according to what is rung and once the sale is completed on the cash register it cannot be undone. 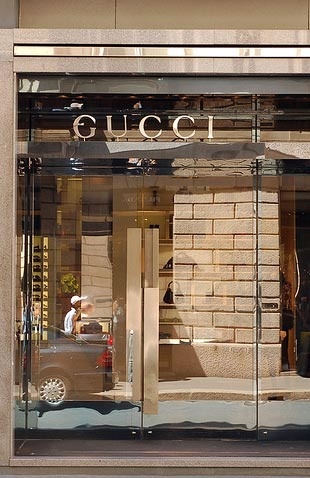 At the designer boutiques near Via Condotti, it is mostly visitors from the United States who are upset by this. The return policies in the States are very liberal and most stores will credit your charge card if you change your mind, as long as the item has not been worn or damaged. It probably never crosses these customers’ minds that this may not be the practice in Italy. Overall, when asked to give an example of the worst behavior they had witnessed, most merchants were hard-pressed to relay an incident. One memorable illustration concerned an upscale candy store where a customer actually spat out a confection onto the floor. The people interviewed were quick to point out that it is rare for shoppers to behave dreadfully. And more than a few noted that bad manners are not restricted merely to foreigners.